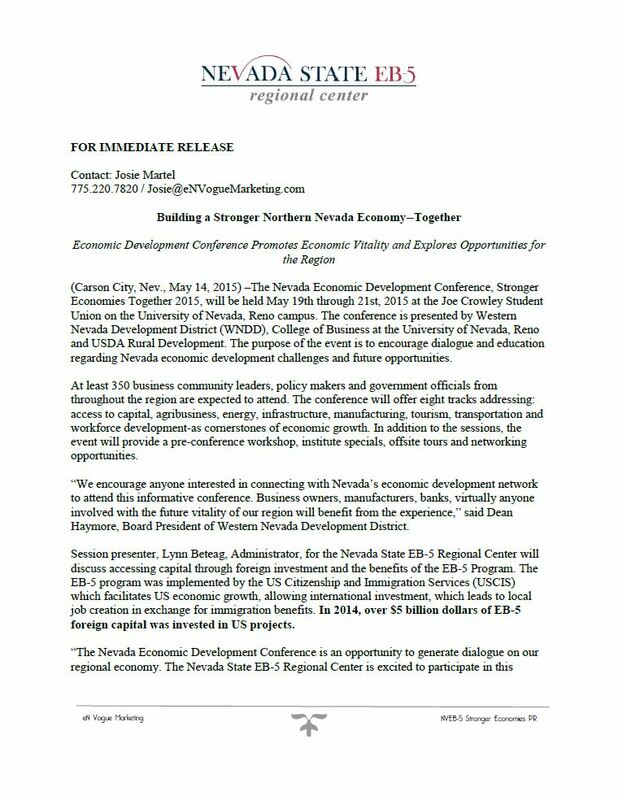 The Western Nevada Development District will be holding Stronger Economies Together, 2015 (an economic conference) May 19th through 21th, 2015 at the Joe Crowley Student Union on the University of Nevada, Reno campus. The purpose of the event is to encourage dialogue and education about Nevada economic development challenges and future opportunities. At least 500 community leaders, policy makers and government officials from throughout the region are expected to attend the event which will focus on a wide-range of discussion topics highlighting Nevada’s economic path. During the conference, nationally recognized experts in creative economic and workforce development will deliver keynote presentations. In addition to the presentation, the event will provide a pre-conference workshop, institutes and education sessions, offsite tours and networking opportunities. The conference will offer eight sessions addressing: access to capital, agribusiness, energy, infrastructure, manufacturing, mining, tourism, transportation and workforce development as cornerstones of economic growth. Scheduled keynoter speakers include Don Macke and Deborah Markley, co-founders of the Center for Rural Entrepreneurship; Patrick McGaughey, a nationally known expert on win-win negotiations and building business-education partnerships; and Jason Broadwater, expert on creative community development and accomplished author. 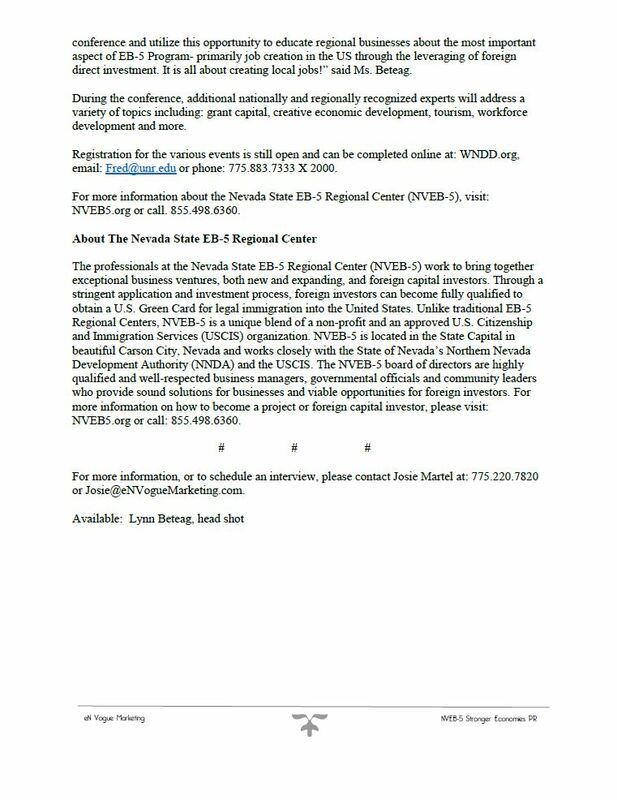 Lynn Beteag, Administrator, for the Nevada State EB-5 Regional Center is also scheduled to present on accessing capital through foreign investment and the benefits of the EB-5 Program; a program implemented by the US Citizenship and Immigration Services (USCIS) which facilitates US economic growth through the EB-5 immigrant investment program allowing international investment leading to local job creation in exchange for immigration benefits. “The Stronger Economies Together Conference will highlight economic tools and economic information that will benefit anyone with an interest in Nevada’s future economic development. I encourage you to attend,” said Lynn Beteag.